Home / ISISrael / Israel / Jews / Syria / Israel seeks Russia's help in obtaining the Egyptian Jewish spy's body from Syria. Yedioth Ahronoth newspaper reported that Israel asked Russia "The main lifeline for the regime of Syrian President Bashar al - Assad" to mediate among the last to recover the remains of its spy Eli Cohen from Syria. The newspaper pointed out that this request made ​​by Israeli President Reuven Rivlin during his recent meeting in Moscow with his Russian counterpart Vladimir Putin. Rivlin had received prior to his recent visit to Moscow, an Israeli security report on the latest developments in the case, and a request from Cohen's widow to express the issue on Putin, who listened to the case, and promised to discuss it with the competent authorities. 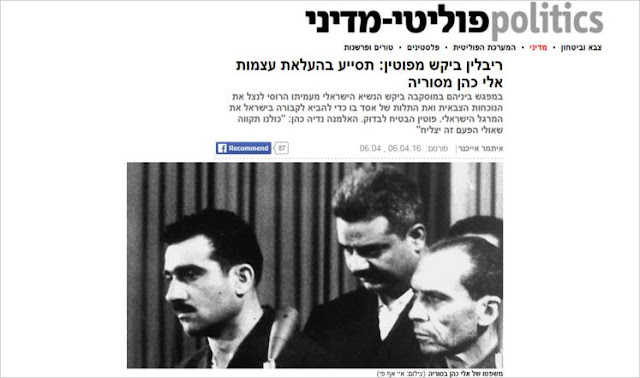 Yediot Aharonot suggests that Israel has been busy to end the issue of Cohen, who spied for Tel Aviv in Syria since the beginning of the sixties of the last century until he was arrested and killed in 1965 at the height of the outbreak of the Syrian war since 2011, through discussion with all the channels turn the page on this issue. Israel has resorted in the past to several international destinations on this issue but to no avail . In 2007 , former Israeli Prime Minister Ehud Olmert asked the Turkish President Recep Tayyip Erdogan's help, as Tel Aviv demanded more than once the interference of the United States in this case, which sent a special envoy to Assad late 2010 to persuade him to end the case. Speaking to Israeli newspaper, Nadia Cohen, widow expressed the hope that Moscow be able to resolve the issue, pointing out that Syria is in such conditions might be in ripe of folding this page. To read more about Eli Cohen.